Here are three “tricks” that I’ve been using a lot lately with Bee, mainly for getting him to cooperate with me and do what he needs to do. These are things he responds really well to, in part because they are playful and engage him, as opposed to demanding he do what I tell him. I thought I’d share my favorite tricks, and I’d love to hear what works well with your preschooler! Club, but you get the idea. I’m sure other characters could substitute. Two Choices With One Crappy Option – Instead of using time-out, when Bee initially refuses to do something I offer him two choices, one of which is to do what I asked him to do and the other is something really unappealing. The something unappealing is generally sitting quietly by himself. Like last night when he didn’t want to come to dinner because he was playing, I told him: “Play time is over right now. You have two choices. You can come eat dinner with us or you can sit on the couch.” Once in a while his choice is, “Nuthin’!! !” which means he really doesn’t like his options, but usually it works like a charm. 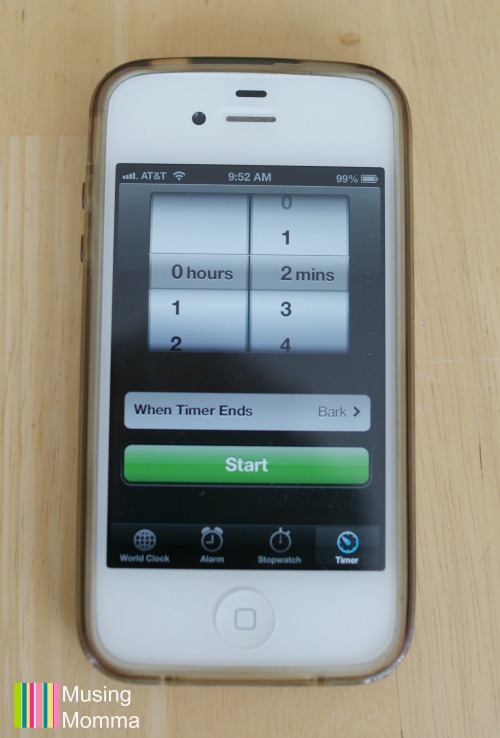 The Timer – When it is time to finish playing or get out of the bathtub or stop some other fun activity, the timer works great. This evolved from us telling him “Two more minutes” to help him transition when we need him to wrap up. I finally realized there is a timer right on my phone (how long did that take me?! ), which means I can use it anywhere. The timer makes “two more minutes” more objective and concrete, and Bee loves telling me which sound he wants to hear when the timer goes off, like the barking dog or the motorcycle. Thank goodness there is no train sound, or I’m sure we’d be hearing that every.single.time! Okay, now it’s your turn! Scroll on down to the comments and share YOUR favorite strategies. I know this may sound weird, but I got an idea from the Inspired to action blog. She has her son do push ups instead of time out because time out worked better for her girls but not her boy. Our very energetic 3 year old boy gets the option of either sitting in time out or doing 3 laps around the house. The layout of our house allows us to do that. He usually will pick the laps, but if he doesn't, he has to sit in time out for 3 minutes AND do 3 laps. We like the laps because it gets all his energy and aggression out, and after he finishes we have a civil discussion which is absent of whining and crying as to why he did what he did, and why he had to do time out or laps. It's worked really well for us so far! The timer is one of my favorites because, it defuses the conflict. Instead of me being the bad guy the timer is. A long time ago, I read Love & Logic. The ideas make so much sense, but are very difficult to remember in the heat of the moment. One thing that stuck with me and my preschooler is, "Uh oh" when an undesirable behavior begins. It the behavior is not corrected within 5-10 seconds, she has "Alone Time", which can be any length of time you see fit. This took some practice from both her and myself, but alone time is something very rare nowaday and the "Uh oh" is enough to stop her in her tracks and rethink what's happening. 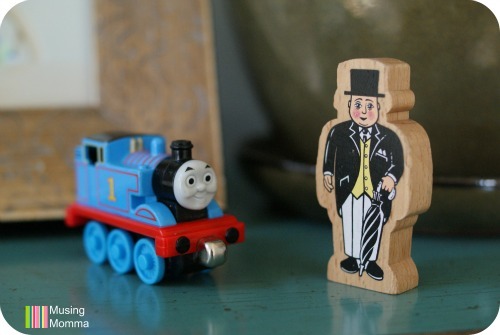 Hey, no weirder than me pretending to be Sir Topham Hatt. 😉 I actually think this idea might work really well with my high energy 6-year-old! Thanks for sharing! Exactly! Can't argue with the timer! 🙂 When we created our "family rules" and posted them on our fridge it had a similar effect – it helps keep a conflict from being a "me-you problem" to something outside the relationship. I have been meaning to read Love & Logic for so long – I've heard lots of parents say they really like it. I love the "uh oh" prompt. Such a great idea! Reminds me a little of "How To Talk So Your Kids Will Listen and Listen So Your Kids Will Talk," where the authors suggest simply pointing out a problem instead of telling the child what to do (e.g. "I see a wet towel on the floor")- that way the child comes up with the solution on their own and feels more empowered instead of bossed around. Thanks for sharing, Nicole! Hi Ellie! I have an almost 3 year old who has entered into a very stubborn and obstinate phase, so it sure was helpful to see what you suggest! I too offer choices which usually helps. My my little guy refuses to come inside, I tell him that he has to come inside but he can choose to walk inside himself or I will carry him in. It usually diffuses the situation immediately as he chooses to walk in himself. He usually changes his tune when refusing to leave when it's time to go when I give my empty threat of "Ok well Baby Sister and I are going to go. We'll see you later" and we walk towards the door. Usually that is enough to make him think he's missing out on something and he is suddenly ready to go. I'll be in trouble when he actually realizes I won't/can't leave without him, in which I'll probably have to resort to carrying him out the door screaming… Timers work wonders for us as well. There was a point when I could just start beeping like the microwave when it was time for him to transition and that was enough to move him on. Not so much anymore, but he loves timers and for some reason, like you said, making the timer the bad person seems to alleviate most problems too! I try to pick my battles and probably let things slide more than I should, but I agree with you on setting those limits now rather than when they are older!! I try hard to always state the positive (roll the ball to your sister instead of don't throw the ball at her) and I try to constantly praise good behavior. I also use lots of "if-thens" with praise and positive reinforcement which works well too. I am also considering doing a "catch you being good" plan where I put a marble in a jar when I see good behavior, like when he plays well with his little sister, or plays nicely with the dog, follows instructions, eats dinner etc. I am a part-time child psychologist so I try hard to practice what I preach but man, sometimes it is just plain hard!!! Also, I followed your lead on the staying quiet in the mornings chart. And since I implemented that back in December, my son went from being loud and awake by 5:30 am pretty much every morning to staying quiet and/or sleeping until close to 7am, all b/c he gets a stamp on his chart when he does! It has worked wonders!! I love your blog! Thanks for taking the time to do it! Hi Julie! Isn't it funny how much easier it is to provide suggestions in the office than to figure out our own kids? Lack of that "optimal therapeutic distance" maybe. 🙂 Being a parent has definitely given me a greater appreciation for families' struggles and how hard it is to remember to use positive parenting in the moment! Thanks for all of the great suggestions. I am SO happy hear how well the morning chart is working! Yay!!!! We have had to switch ours up here and there, but our little guy is still staying in bed in the morning too. Thank goodness! So glad to have you reading. I like your strategies, especially Sir Topham Hatt. That is so creative to use a character he likes to influence positive behavior.